Layer cakes are easy to make and yet impressive. While we’ve not gone for the full on cherpumple pie in a cake here, the equally impressive four layers in this cake will make everyone ooooo and aaaaah when it is brought to the table. Want to go less towering? Make this into two cakes and increase the amount of icing rolled but the ganache should be OK if you don’t spread it too thickly. To be sure just increase by 100mL on double cream and 100g of white chocolate. Choose a quality white chocolate like Green and Blacks or Askinosie. Why? Bad quality white chocolate has additives like palm oil, lots of vanilla and bad milk powder. So the key to making this cake work is to not add in palm oil from the chocolate into the icing. To make the ganache, heat the cream in a saucepan until boiling. Place the chopped chocolate in a large bowl, pour over the cream and stir thoroughly. Leave to stand for 2-3 minutes then mix well again until the chocolate is melted and the mixture very smooth. Leave to cool at room temperature for 30 minutes before chilling in the fridge for at least 2-3 hours, stirring occasionally, until firm enough to be spreadable. Preheat the oven to 180°C/Gas 4 and lightly coat the 5 pans with Cake Release. For the white chocolate sponges, place the butter and chocolate in a heatproof bowl over a saucepan of simmering water. Heat gently for 3-5 minutes, stirring occasionally, until melted, smooth and well combined. Beat the eggs and sugar in a bowl until well combined then beat in the chocolate and butter mix. Sift the flour into the bowl and gently fold in until smooth and well combined. Divide the mixture between 2 of the pans and smooth the surfaces, making a slight dip in the centre to help achieve an even rise. For the red velvet sponges, stir together the buttermilk, red colouring and vanilla extract in a jug until well combined. Pour into a large bowl then stir in the butter, sugar and eggs, sift in the flour and cocoa then mix. In a small bowl, mix the bicarbonate of soda and vinegar until they fizz. Stir into the cake mixture then beat with an electric hand mixer for 1-2 minutes until smooth and well combined. Divide the mixture evenly between the 3 remaining pans and smooth the surfaces, making a slight dip in the centre. Place all 5 pans in the oven, evenly spaced, and bake for 15-18 minutes or until a skewer inserted into the middle of each cake comes out clean. Wait 5-10 minutes before removing the cakes from their pans then leave to cool completely on a wire rack. To assemble, place a red velvet sponge on a plate and spread with ganache. Top with a white chocolate sponge and repeat, alternating the sponges until all are sandwiched with ganache. Spread the remaining ganache evenly over the top and sides of the cake using a palette knife. Lightly grease a surface with white fat then roll out the green icing and cut out 6 medium and 14 small holly leaves, re-rolling the trimmings as needed. Then roll the red icing into very small berries and arrange the leaves and berries around the top of the cake in a circle, as shown. 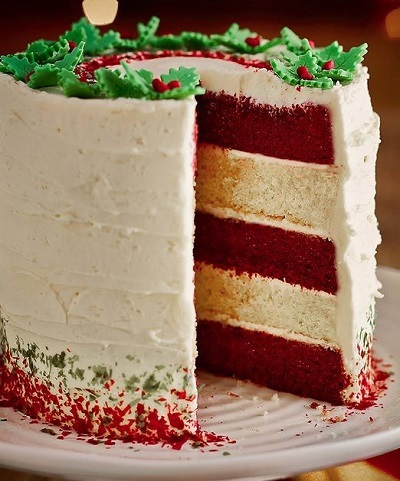 Lightly sprinkle the bottom of the cake with red then green sparkles and chill for a further hour before serving.